Introduced on June 5, 2017 at Apple's Worldwide Developers Conference (WWDC), the new 10.5-inch iPad Pro has a larger display with a slimmer bezel compared to previous 9.7-inch iPad Pros. 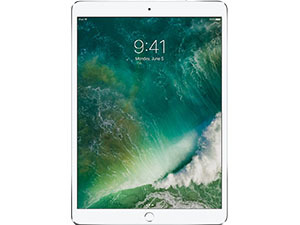 Featuring an A10X Fusion chip with 64-bit architecture, the 10.5-inch iPad Pro has a True Tone, Retina display with 2224 x 1668 resolution at 264 pixels per inch (ppi). The fully laminated display also has an anti-reflective coating, which resists fingerprints as well. The 10.5-inch iPad Pro features ProMotion technology and weighs in at just over one pound (1.03 pounds for Wi-Fi models and 1.05 pounds for Wi-Fi + Cellular configurations). Storage capacities begin at 64 gigabytes with prices starting at $649.